I always like to keep a few get well cards on hand, so I made this one for my stash. I used the SU! Healing Hugs stamp set in colors of Melon Mambo and Wild Wasabi; stamping the flower twice, fussy cutting one and popping it up with dimensionals directly on top of the stamped one. The panels were done with a die set from Gina Marie Designs in white, black, and Melon Mambo. I inlaid the white one into the black and added the frame to the top of the black. All this needed was a few black Nuvo crops to finish it. I think I'll try making more of this design in different colors because I like how it turned out! I'm sharing with the Happy Little Stampers July Anything Goes with Dies challenge. Thanks for stopping by and do have a great Friday! Wow, Carol, what a lovely card! 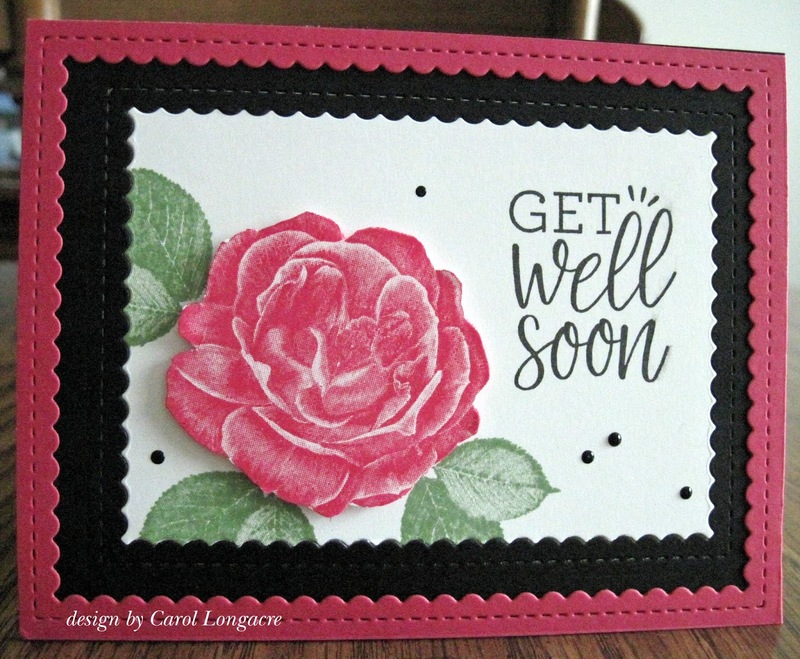 The layers of stitched and scalloped die-cuts make a wonderful frame for your goegeous flower. Thanks so much for joining our HLS July Anything Goes With Dies Challenge. A beautiful card Carol, a gorgeous rose and great dimension - this card would certainly make me feel better. I love how it turned out! GORGEOUS!!!! I can see it in so many different colors too. Love your card. This is so beautiful. A great rose design. BEAUTIFUL Carol, just a stunning card and love the gorgeous stamp.. I have enjoyed every card I have seen made with this lovely bloom....so many pretty colors, and the frames are awesome. So pretty! I love how you framed it.Thanks for joining us at Happy Little Stampers!